Inspector Colin Skeath, Halifax Neighbourhood Inspector. Police are calling on the public to shop speeding motorists as they aim to make the district’s roads safer. Officers are set to tackle routes in Halifax, Brighouse, Todmorden and Hebden Bridge which have been identified as dangerous by members of the public. 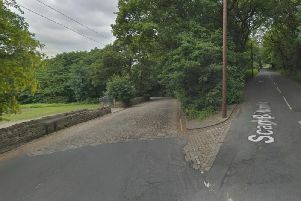 Now they are urging residents to inform them of roads that have problems with drivers in the district to enable them to win their “battle to reduce the number of vulnerable road users seriously injured in Calderdale”. The message comes after recent enforcement operations in Halifax found motorists driving at nearly double the speed limit on residential roads in built up areas. Inspector Colin Skeath, of the Halifax Neighbourhood Policing Teams, whose officers carried out the operation, said: “If people are concerned about speeding motorists on their road and tell us about it then we will take action - whether that be going out with the speed indicator device (SID); sending motorists on speed awareness courses; issuing them with a fine or penalty points; sending them to court; or working with Calderdale Council on improved signage. This week - acting on information from members of the pub - PC Anna Law carried out speeding operations on Wakefield Road, Copley; Siddal New Road, Siddal; Shay Lane, Ovenden, and Warley Road - all Halifax. Working with colleagues from the Casualty Reduction Bureau and Special Constables, 13 traffic offence reports - which can be anything from fines to a court appearance - were issued and 36 motorists were followed up at a later date. This is because on Wakefield Road (30 miles per hour limit) one motorist was clocked doing 51 mph; on Siddal New Road (30 mph limit) a motorist was doing 48 mph; on Shay Lane (30 mph limit) a motorist was travelling at 49 mph; and on Warley Road (20 mph limit) 161 cars were doing over 25 mph. And Insp Skeath, who confirmed that all neighbourhood policing teams officers have been trained in how to use laser speed guns, said that although operations are being done on a weekly basis intelligence from residents would ensure that they are targeting the most at risk areas. Speeding hot spot. Siddal New Road. And of the upcoming operations in Halifax, Brighouse, Todmorden and Hebden Bridge, he added: “They have been identified by local residents as areas of concern. We have confirmed that and will be following it up with action. To report a dangerous road, call the police via 101, or go to your next ward forum or Police and Communities Together meeting. Speeding hot spot. Warley Road, Halifax.